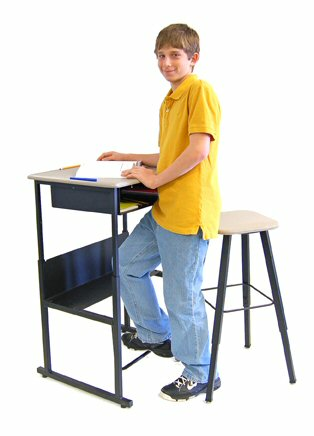 Stand Up For Learning desks are ergonomic, patent-pending student workstations that combine height adjustability with the patent-pending Pendulum foot rest. The foot rest allows students to shift weight and expel energy throughout the day. The desk can be adjusted from 26" to 42" to accommodate both sitting and standing applications through a wide range of height differences. But the benefits of standing - enhanced mental focus, increased caloric expenditure, improved body ergonomics, better handwriting, to mention just a few - are not limited to students alone. Adults at home and at work can appreciate the advantages of spending more time standing throughout the day. Testing related to health and academic advantages is currently being conducted by the University of Minnesota and other independent research facilities. All steel base and frame. Height adjustable from 26" to 42"
Pendulum (patent-pending) swinging footrest naturally corrects body posture while providing stress relief for the lower back. 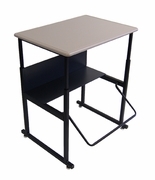 Desk top: 20" x 28" x 5/8"
Height: Adjustable from 26" to 42"
Colors: Black base, beige-tone desk top or Black base, gray tone desk top. Add Optional Casters using the dropdown menu when placing your order.